One of the biggest signings of this summer transfer window is without doubt Luis Suarez’s move to Barcelona for a price tag of £75 as the Spanish club wants to win major titles in the next season which was something that Barcelona failed to do in the previous season. But even before Barcelona displayed interest in signing the Uruguayan phenomenal there were a number of clubs that were willing to go deep in their pockets and sign Luis Suarez including Arsenal as the team of Arsene Wenger launched an offer of £40m hoping that it would be enough to sign Luis Suarez but it never happened. The iconic figure of Liverpool, Steven Gerrard has now revealed that he suggested Suarez to not join Arsenal as Suarez is simply too good for them. Along with Luis Suarez, there has been another dominant figure throughout the entire season which is one of the main reasons on why Liverpool still continues making a genuine charge at the top of the Premier League and that player is Steven Gerrard. Steven Gerrard’s performances can be evidenced by one of his recent pieces of silverware as he was awarded with the PFA Player of the Month Award in March. The veteran midfielder had to share the award with Luis Suarez. Liverpool midfielder Steven Gerrard has said that this is too early in the season to start thinking about titles. Liverpool have not finished in the top four for the last four seasons, but they have made a tremendous start to this campaign. They are second in the table only a couple of points behind Arsenal, which has given their fans hope that they can lift the Premier league title for the first time in their history. Liverpool have won numerous league titles, but never the Premier league title in their illustrious history. Steven Gerrard has said that England should go into their next World Cup qualifying match against Ukraine with self belief. England is currently at the top of the Group H points table. They have got 15 points in 7 matches. Montenegro also has got the same no. of points, but, they are no. 2 on the basis of goal difference. Ukraine which is at the 3rd position is also not too far behind. They have managed to secure 14 points in 7 games. So, the game between Ukraine and England is extremely vital. The outcome of this game can change the positions of the top 3 teams in the points table and Gerrard admitted that. England will enter the match against Ukraine without its two main strikers i.e. Danny Welbeck and Wayne Rooney. Welbeck is out because of suspension, while, Rooney is not 100% fit. In the absence of these two players, the 31 years old Rickie Lambert is going to be the leader of the visitors’ attack. The Southampton striker has already found the net a couple of times in the 2 matches that he has played for England so far. After this game against Ukraine, England will play two more World Cup qualifiers. Both of them will be the home games. Liverpool and England captain Steven Gerrard has said that he could be in his final year of international football and he wants to make the most out of it. The 33-year-old is likely to play at the 2014 FIFA World Cup. However, he has conceded for the first time that it could be his last involvement with the national team. He does not see himself part of the national team in three years time when he will be 36 years of age. The midfielder recently made 100 appearances for the national team, thus putting him amongst the elite group of players to have achieved this record. He is regarded as one of the finest midfielders of his generation and England will certainly miss him once he retires. Gerrard has said that he is aware that he does not have a long time left in football. Hence, he wants to enjoy the current run of matches more than ever. The midfielder, though, is confident that England will be able to find a suitable replacement for him. In fact, he has suggested that Arsenal midfielder Jack Wilshere could be the very replacement. After coming through the ranks at Arsenal, Wilshere has already made his debut for the national team. “I’ve got to assume it’s my last year. I can’t assume I’m going to be here in two or three years’ time. I’ve got to make the most of every single game. For all I know, I might be out of the picture in a year’s time. I want to make the most of it. Jack is so good I am sure when he gets to my age he will be sitting in my position with the armband on talking about another 100-cap player. I’ve got no doubt he can (be the man who succeeds him),” said Gerrard. The Liverpool skipper, Steven Gerrard, has got back to 100% fitness and he has started full training. This is great news for the Liverpool manager Brendan Rodgers and also, for the manager of the England team Roy Hodgson. Gerrard had discovered a shoulder injury while playing in a Premier League match against Newcastle United towards the end of the last season. He went for the scan after the match. The scan reports suggested that the injury was serious and the surgery was required. Gerrard went through the surgery immediately and was ruled out for the rest of the season. He missed Liverpool’s last couple of Premier League games of the season against Fulham and Queens Park Rangers. Because of that surgery, Gerrard was also not able to take part in England’s friendly matches against Brazil and Ireland either. Gerrard’s recovery went quite well after the surgery and he regained 100% fitness in quick time. The Liverpool players will gather for pre season training in the first week of July, but, Gerrard has come back to the training ground a couple of weeks earlier. He has been training hard at the Melwood ground since the last few days. Gerrard is supposed to feature for the Reds in their first pre season contest against Preston North End at Deepdale on 13th of July. After that match, the Reds will go on pre-season tour of Indonesia, Thailand and Australia. They will play three matches on the tour against Indonesian XI (20th July), Melbourne Victory (24th July) and Thai National Team XI (28th July) respectively. The Liverpool team will then return to UK to face Olympiakos at Anfield on 3rd of August. That will be Steven Gerrard’s testimonial match. The Reds will play two more pre-season games after that against Valerenga and Celtic respectively before starting their Premier League campaign against Stoke City on 17th of August. Liverpool are on the brink of elimination from the Europa league after suffering a 2-0 defeat in the first leg against the Russian club Zenit St Petersburg. The five-time European champions have been unable to qualify for the Champions League in the last few seasons, and the Europa league has also not been fruitful to them. However, the midfielder Lucas is extremely confident they will be able to progress into the next round due to the home advantage in the second leg. He has also said that the leadership of Steven Gerrard will be able to carry them as it has on several difficult situations in the past. The former Porto winger Hulk scored the first goal for Zenit St Petersburg, which was followed by the goal by Sergei Semak. If Liverpool are knocked out of this competition, then the FA Cup remains as the realistic opportunity to win a silverware this season. Lucas has said that the club not only needs to play attacking football in order to get the goals, but they also need to be aware in defence as well. Lucas has recalled how he has been playing with Steven Gerrard for the past six years, and he has not seen the hunger to win diminish within the England international. “I’ve been playing with him for six years already and every week we can see Stevie still has the hunger to win games and be the special player that he has always been for the club. He’s playing in a different position than he used to a few years ago and he’s still able to change the game. I’m just very happy that we have him on the team — his leadership always makes our life easier. We know about the special European nights at Anfield that the crowd give us,” said Lucas. The Liverpool manager Brendan Rodgers has said that the club should be working hard enough to tie the 32-year-old midfielder Steven Gerrard on a long-term contract. The Liverpool midfielder has been one of the influential players for the club over the past decade. Despite turning 32 years of age recently, he still has a massive influence on the team according to the manager. He also looks after himself extremely well, which means that he still has many years left ahead of him. Hence, the manager has persuaded the Liverpool board to consider offering Steven Gerrard a new contract. The Liverpool captain’s contract comes to an end in just over 18 months. Even though he has previously rejected the possibility of joining other teams, Rodgers has said that it is extremely important that the club secured the future of one of their important players. Despite entering into the twilight of his career, Gerrard has been able to make it into the starting lineup of every Premier league match. He recently scored in the matches against Aston Villa and Fulham. Even though it has not been a great scoring season for Gerrard, his influence on the pitch cannot be doubted. Gerrard has made more than 600 appearances for the club since making his debut as a teenager. “I don’t think there’s any question we want to extend his contract. Steven has a real hunger to succeed. He’s 32 years of age but he’s still got so much left. He’s still been making the runs and his influence within the team has been outstanding. His influence for me, especially once he’s started to understand what I’m looking for, has been absolutely first class,” said Rodgers. 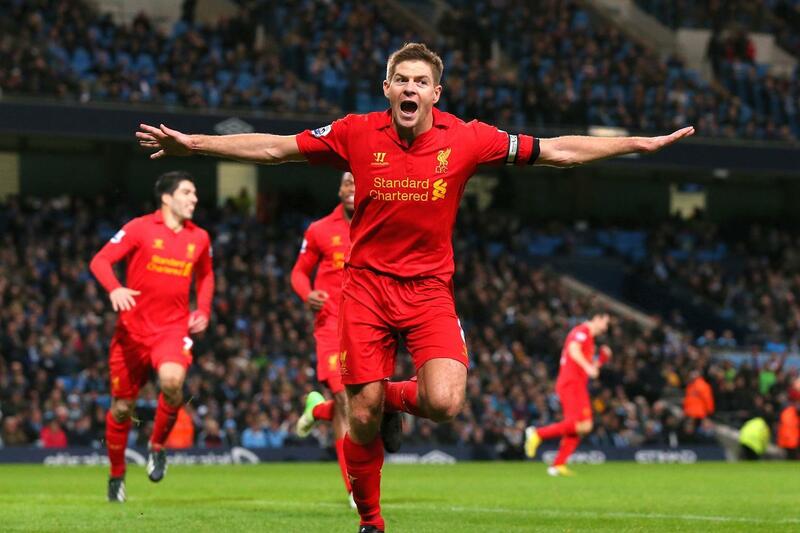 In total, Gerrard has made 18 appearances in the league and has scored four goals. Liverpool are in the eighth position in the league table.